We pride ourselves on being at the forefront of print, signage and display technologies. Signage is any kind of graphic display that tells people about a business. Signage can take be high quality banners in various forms, billboards, lightboxes or much more. Large format digital printing allows the latest technology to take care of printing large-scale items such as billboards. It offers size that can’t be missed and quality that can’t be surpassed. Say hello to the future of printing! UV LED inks dry as soon as they are exposed to ultraviolet light, resulting in a pristine, crisp finish. UV direct printing can be used on just about any substrate. The 2.5 × 1.6 m flatbed UV printer Impala is now available with the latest generation of print heads that push its top printing speed from 130 to 180 m² per hour while delivering quality well above par for practical needs. Impala, the mid-sized model in the swissQprint range, is now more productive than ever. The latest generation of print heads provide the reason why. An existing Impala in draft mode can print up to 130 m² per hour with highly acceptable quality. The new print heads do away with draft mode, bringing finer resolution that will print substrate cleanly at 180 m² per hour – a twofold benefit for users. Despite its modest dimensions, the Impala can print formats up to 2.5 × 4 m in flatbed mode. The secret lies in the board option. And like all other swissQprint models, Afterwards they can go home secure in the knowledge that the swissQprint system is doing a reliable job. The Impala has nine freely configurable colour channels. Standard CMYK is readily supplemented by white, effect varnish, primer, or other colours. Those may be light colours – for nuanced shading – or orange, green and violet for a massively expanded colour gamut. The standard inks adhere to many commonplace as well as not-so-conventional substrates, so experimentally-minded sign makers and their customers can give full rein to creativity. Point of sale displays can be the eye-catching attention grabbers that entice store visitors to become paying customers. Put your company on the map and get your message seen on the road with a variety of vehicle branding solutions. No job is too big – or too small – for Print Division. Small run digital printing takes care of business cards, promotional materials and much more. With a number of our own experienced installation teams and a fleet of delivery vehicles, Print Division can ensure that all delivery and installation deadlines are strictly adhered to. Top quality signage gets installed in Print Division’s top quality way. The Mimaki JV33 provides the perfect blend of high quality output and speed. It prints to a width of 1.6m using eco-solvent inks. These printers are engineered to make products that can withstand the harsh African sun and last the test of time. Using the Mimaki is a cost-effective way to create vinyl prints and posters. The SIJ-320 is the latest technology in UV printing on roll to roll machine. 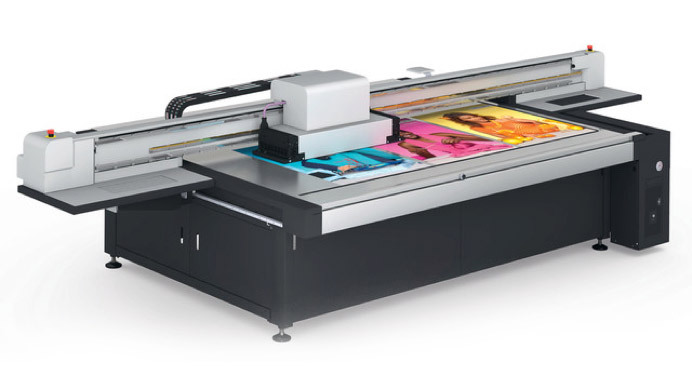 Taking advantage of the 3,200-mm printing width, two media rolls can be mounted for simultaneous printing. Different print jobs (or the same print job) can be printed on two separate rolls. The user can select the preferred width separately for each roll, within a specified range (210 to 1,524 mm). 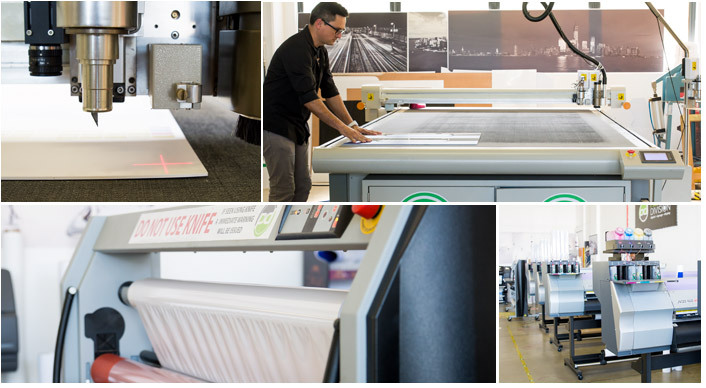 The Swiss Q Flat Bed is tailor-made for printing onto flat sheet substrates such as correx, signex, b flute, e flute, perspex, ABS and the like. This flatbed UV printer delivers quality that surpasses expectations. Thanks to extremely fine resolution, substrates can be printed cleanly at 180m². The Impala can print formats up to 2.5x4m in flatbed mode, and boasts nine freely configurable colour channels. Using photosensitive ink, which dries when exposed to a concentrated light source, brings our customers unique benefits and crystal clear prints. This machine prints white onto clear substrates such as correx, signex, b flute, e flute and perspex. It does this while allowing us to harness all the benefits of UV printing and bring you crystal clear end products. In essence, the Oce’ Flatbed is a form of sign printing equipment that’s ideal for creating large format outdoor signage, exhibition displays, directional signage and other related products. Longevity, quality, value and speed – this printer offers it all while making it possible for your business to stand out from the crowd. 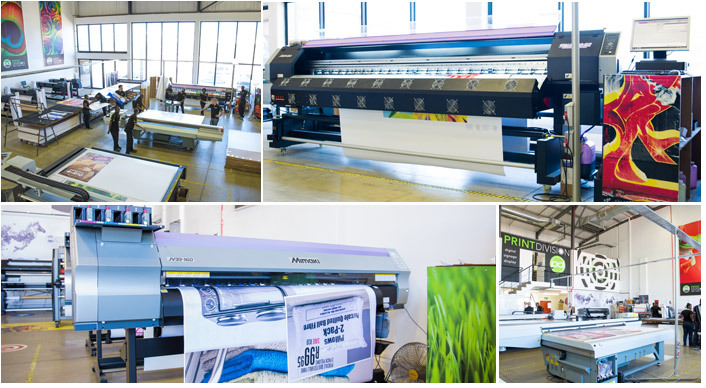 The canvases, wallpapers and high-end custom vehicle wraps created by this machine will take your enterprise to the next level. Latex printing is environmentally friendly and uses six colours that will transform any image into a masterpiece. The Plotter is used to die-cut vinyls to any specific shape required. The Flatbed is used to cam-cut hard substrates to any shape or size. This is valuable when preparing point-of-sale materials, hanging mobiles, shelf talkers and the like. Hot lamination works by means of a heat-activated adhesive. This is the preferred method as it is more durable than cold lamination. Cold Laminators use a pressure-sensitive adhesive that does not require heat. Specialised rollers push the sheets of laminate material together, making this form of lamination safe for almost every flat item. Print Division’s laminators are 1.6m in size. This machine is used to bend substrates to various angles as required. Thanks to the Heat Welder, pockets and trims can be welded onto Print Division’s PVC prints. The In-Line Heat Bender bends acrylic substrates to various angles. This is particularly useful in constructing products like tent cards, menu holders and table talkers.